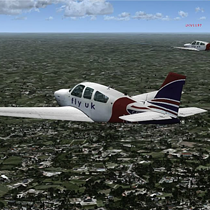 The General Aviation Flying Club for Fly UK members. 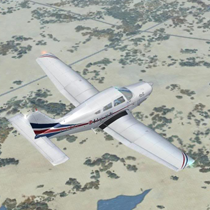 Take a break from airline flying and hop into a light plane or helicopter and either go solo or for more fun, join other members flying VFR online on multiplayer. You'll have a personal log-book if you wish to log your flights as you go. 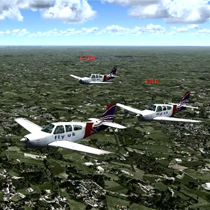 We hold informal VFR events, wherever FS will take us. 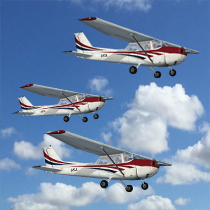 Serious fixed-wing training is also available from one of our qualified PPL instructors. 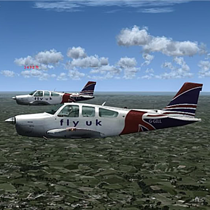 Remember, we also have a weekly informal gathering/flight, every Wednesday evening on the Fly UK Teamspeak - head down to the Flying Club room. New members always welcome and we're happy to help solve problems or answer questions. This is the software we use to communicate via voice. 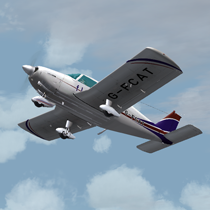 We encourage all members to come onto Teampseak when flying around on the Fly UK FSD server, there is a Flying Club channel on the Teamspeak server especially for this. You'll be able to meet and talk to other members who maybe flying around at the same time. 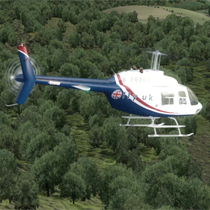 Fly UK FSD - We encourage all members to come and fly for the flying club online, this way you'll see others and have some traffic. Flying offline VFR with no traffic can be a bit boring. To connect to the FSD server you will need FSCoPilot and FSINN installed. Click the 'Training & Help' button above for a PDF guide on how to setup the software, alternatively you can book a course with the Training Academy. IVAO & VATSIM - You can also fly online on IVAO/VATSIM. When doing so, you will need to use your aircraft registration as your callsign, not your UKV pilot ID for a VFR flight. If you have any comments, ideas or suggestions please do not hesitate to contact the Flying Club Team. We look forward to flying with you soon! How do I join the Flying Club? Just file a Flying Club PIREP. – if you fly one each month your name will stay in the Active Members list. However, if you enjoy general aviation flying why not consider flying with us on our regular Wednesday evening flights which are detailed in the Flying Club forum under Flight Information – or join us on one of our monthly events. What aircraft can I fly? Wednesday evening flights and monthly event flights will be restricted to 2267kg (5000lbs) unless otherwise advised. How do I file a Flying Club PIREP? Skytrack will record your flight and file your pirep. Choose 'Start Flying Club Flight' from the dropdown. However, if you can't get online, go to Operations>Flying Club and use the 'log a flight' tab to upload your saved .xml file. The same rules as for mainstream flights apply i.e. single continuous flights starting and finishing at the gates/parking with the engines turned off. En-route touch and go's should not be recorded as separate flights. Skytrack will record as a continuous flight until you park and switch off. Do Flying Club PIREPs keep me active? Are Flying Club PIREPs included in my logbook backup? Do I have to fly VFR? No, but you'll enjoy it a lot more if you do. Can I use the GPS/Navaids etc? Yes. Anything that is available in your cockpit. But please don't just 'follow the purple line'. Can I use the Autopilot? Yes. But use it sparingly and only when it is appropriate. Can I use external aids such as FS-Commander or Plan-G? Yes, but, with the same notes as for flying with the GPS and the AP. For group flying these are recommended for situational awareness. Where can I find the Flightplan/Routes etc? There aren't any. It's part of the fun to work that out for yourself. Monthly events and Wednesday evening flights may sometimes give a route plan. 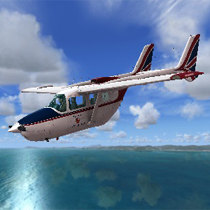 Look for these in the Forums under 'Flying Club>Club News and Events or >Flight Information. Which server do you use for online flights? The Fly UK FSD server is used for our regular flights but you can use Vatsim and IVAO if you fly yourself. What time are the Flying Club informal sessions? Every Wednesday, from 7pm UK local time. I use FS2004. Can I still join? Yes. FSInn supports both simulators. Do Flying Club events have ATC control? When are the monthly events? Generally on the third Sunday of each month from 1400 UK local time. What are the Flying Club Teamspeak rooms for? The Club Room is for general chit-chat. There may be times when an in-flight radio room is available for when we're flying. Please DO NOT use this room unless you are actually participating in a session. Popham Radio is for specific use when flying around Popham. Popham Radio Service may be available on Sundays and is not full ATC but a ground/air advisory service. What callsign should I use? Anything suitable but do not use your Fly UK pilot ID. Most pilots use the callsign G-FC? ?, where the last two letters are your initials. We generally abbreviate this to just the initials. Please check here for callsigns already in use by club members and for more info. 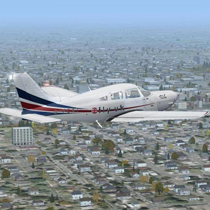 What are VFR procedures flights? These are held every 3 months on the Sunday event and are where we practice specific aspects of VFR flight. These events are more formal than the normal events and a certain level of competence is expected. What software do I need for online flights? You need the correct version of FSInn as well as Teamspeak (version 3). The older version of vPilot with the FSD proxy (will also connect you. I need help connecting to Flying Club online sessions. What should I do? I can't get FSInn to connect to the server. What should I do? Book a Training Academy 'FSD software setup' session. I'm getting a ghost image of my plane. In FSInn Control Panel, go to SET then find the networks menu. Select 'Peer-to-Peer' and untick the 'automatic peer-to-peer establishing' box. I can't see everyone when we are on the ground. In FSInn Control Panel, go to SET then find the multiplayer menu. Untick the 'Filter non-moving aircraft' box. Other pilots do not display as the correct aircraft. What is wrong? Nothing is wrong. FSInn will try to display other people's aircraft from your own local hangar. If you don't have that particular aircraft it will display the nearest guess. Please DO NOT spend time on the radio discussing what other people's planes look like! Other pilot's planes look like their engines are not running/are showing with chocks on the taxiway. What is wrong? What time should I use in the simulator? Unless otherwise specified, set your simulator time to Day in the simulator menu. What weather should I use in the simulator? The recommended method is to set your simulator weather to 'clear skies'. Once you connect to the server this should automatically change to the real world weather from the server. If this weather is inappropriate (i.e. below VMC minima) then you'll be asked to change to CAVOK on the FSInn control panel. On Teamspeak we call this CAV-GREEN. Do I need any other software? Plan G (freeware) from http://www.tasoftware.co.uk/ is good for situational awareness because you can see pther pilots on the server within your map.